"Contains material originally published in magazine form as Guardians of the Galaxy #1-12"--Page facing title page. "With the fabric of the universe torn, all that stands between us and invading horrors is a team of cosmic misfits. Led by Star-Lord, the newly-minted Guardians of the Galaxy include a who's who of the mightiest -and most bizarre - protectors the stars have ever seen! 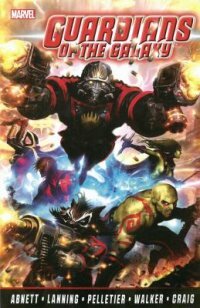 Rocket Raccoon, Drax the Destroyer, Groot, Gamora, Adam Warlock, Mantis, the all-new Quasar, Cosmo the telepathic space dog and more take on the universe's most dangerous menaces...and have fun while doing it!" -- summary from amazon.com. Description: 1 volume (unpaged) : chiefly illustrated ; 26 cm. Graphic novels. -- United States.